Carry out troubleshooting in accordance with the procedure on the following page. Here, only the basic procedure is shown. Details are provided in Diagnostics section, showing the most effective methods for each circuit. 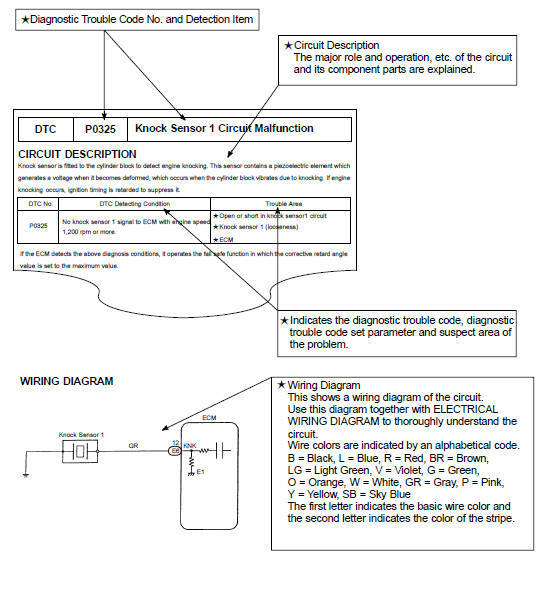 Confirm the troubleshooting procedures first for the relevant circuit before beginning troubleshooting of that circuit. In troubleshooting, the problem symptoms must be confirmed accurately and all preconceptions must be cleared away in order to give an accurate judgment. To ascertain just what the problem symptoms are, it is extremely important to ask the customer about the problem and the conditions at the time it occurred. Important Point in the Problem Analysis: The following 5 items are important points in the problem analysis. Past problems which are thought to be unrelated and the repair history, etc. may also help in some cases, so as much information as possible should be gathered and its relationship with the problem symptoms should be correctly ascertained for reference in troubleshooting. 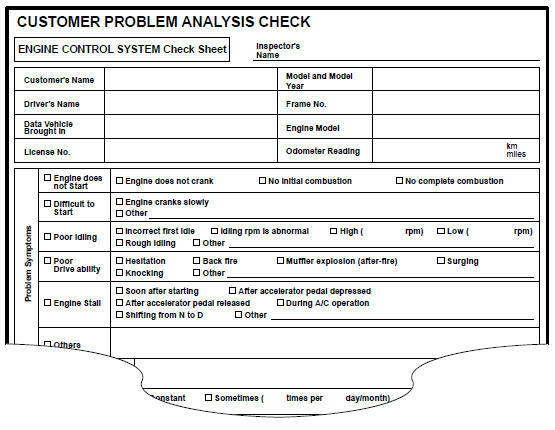 A customer problem analysis table is provided in Diagnostics section for each system for your use. (Sample) Engine control system check sheet. The diagnostic system in the LAND CRUISER fulfills various functions. 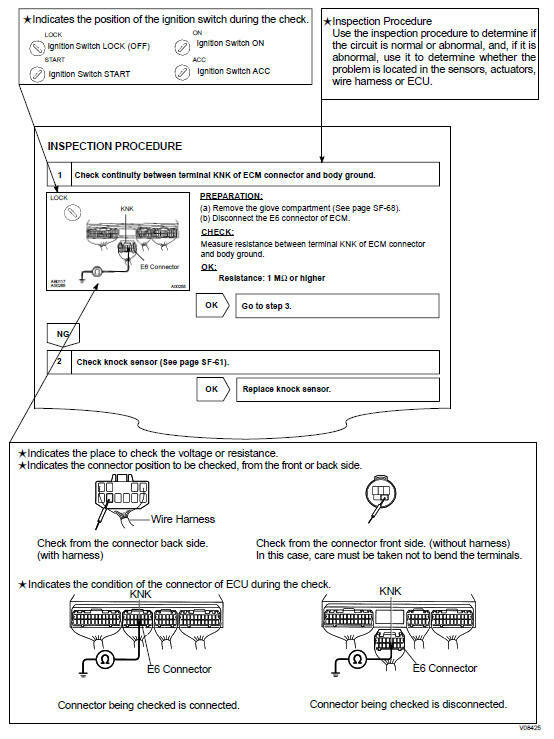 The first function is the Diagnostic Trouble Code Check in which a malfunction in the signal circuits to the ECU is stored in code in the ECU memory at the time of occurrence, to be output by the technician during troubleshooting. Another function is the Input Signal Check which checks if the signals from various switches are sent to the ECU correctly. By using these check functions, the problem areas can be narrowed down quickly and troubleshooting can be performed effectively. Diagnostic functions are incorporated in the following systems in the LAND CRUISER. In diagnostic trouble code check, it is very important to determine whether the problem indicated by the diagnostic trouble code is still occurring or occurred in the past but returned to normal at present. In addition, it must be checked in the problem symptom check whether the malfunction indicated by the diagnostic trouble code is directly related to the problem symptom or not. For this reason, the diagnostic trouble codes should be checked before and after the symptom confirmation to determine the current conditions, as shown in the table below. If this is not done, it may, depending on the case, result in unnecessary troubleshooting for normally operating systems, thus making it more difficult to locate the problem, or in repairs not pertinent to the problem. Therefore, always follow the procedure in correct order and perform the diagnostic trouble code check. 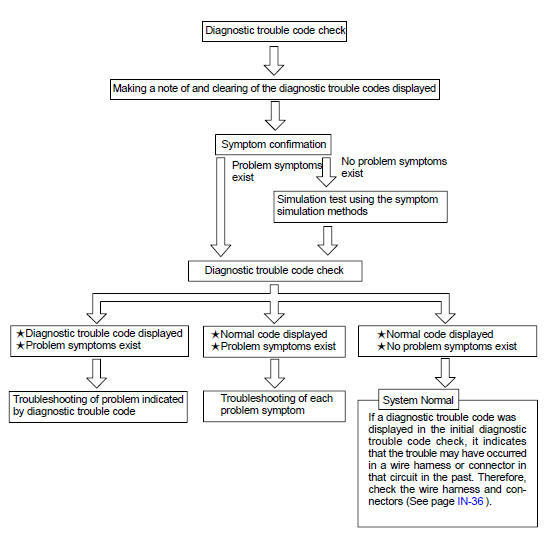 Taking into account the above points, a flow chart showing how to proceed with troubleshooting using the diagnostic trouble code check is shown below. 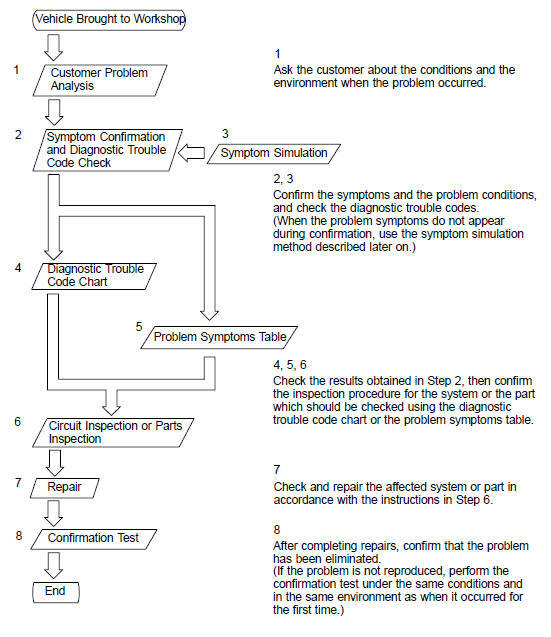 This flow chart shows how to utilize the diagnostic trouble code check effectively, then by carefully checking the results, indicates how to proceed either to diagnostic trouble code troubleshooting or to troubleshooting of problem symptoms table. The most difficult case in troubleshooting is when there are no problem symptoms occurring. In such cases, a thorough customer problem analysis must be carried out, then simulate the same or similar conditions and environment in which the problem occurred in the customer's vehicle. No matter how much experience a technician has, or how skilled he may be, if he proceeds to troubleshoot without confirming the problem symptoms he will tend to overlook something important in the repair operation and make a wrong guess somewhere, which will only lead to a standstill. For example, for a problem which only occurs when the engine is cold, or for a problem which occurs due to vibration caused by the road during driving, etc., the problem can never be determined so long as the symptoms are confirmed with the engine hot condition or the vehicle at a standstill. Since vibration, heat or water penetration (moisture) is likely cause for problem which is difficult to reproduce, the symptom simulation tests introduced here are effective measures in that the external causes are applied to the vehicle in a stopped condition. Important Points in the Symptom Simulation Test: In the symptom simulation test, the problem symptoms should of course be confirmed, but the problem area or parts must also be found out. To do this, narrow down the possible problem circuits according to the symptoms before starting this test and connect a tester beforehand. After that, carry out the symptom simulation test, judging whether the circuit being tested is defective or normal and also confirming the problem symptoms at the same time. Refer to the problem symptoms table for each system to narrow down the possible causes of the symptom. CONNECTORS Slightly shake the connector vertically and horizontally. WIRE HARNESS Slightly shake the wire harness vertically and horizontally. 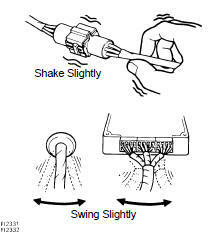 The connector joint, fulcrum of the vibration, and body through portion are the major areas to be checked thoroughly. PARTS AND SENSOR Apply slight vibration with a finger to the part of the sensor considered to be the problem cause and check that the malfunction occurs. 2 HEAT METHOD: When the problem seems to occur when the suspect area is heated. Heat the component that is the likely cause of the malfunction with a hair dryer or similar object. Check to see if the malfunction occurs. Do not apply heat directly to parts in the ECU. Sprinkle water onto the vehicle and check to see if the malfunction occurs. Never sprinkle water directly into the engine compartment, but indirectly change the temperature and humidity by applying water spray onto the radiator front surface. Never apply water directly onto the electronic components. HINT: If a vehicle is subject to water leakage, the leaked water may contaminate the ECU. When testing a vehicle with a water leakage problem, special caution must be taken. 4 OTHER: When a malfunction seems to occur when electrical load is excessive. Turn on all electrical loads including the heater blower, head lights, rear window defogger, etc. and check to see if the malfunction occurs. 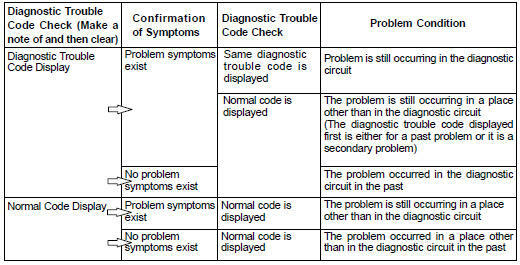 The suspected circuits or parts for each problem symptom are shown in the table below. 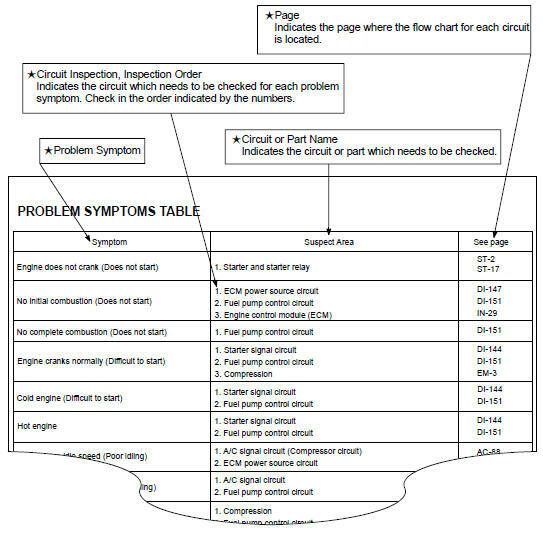 Use this table to troubleshoot the problem when a "Normal" code is displayed in the diagnostic trouble code check but the problem is still occurring. 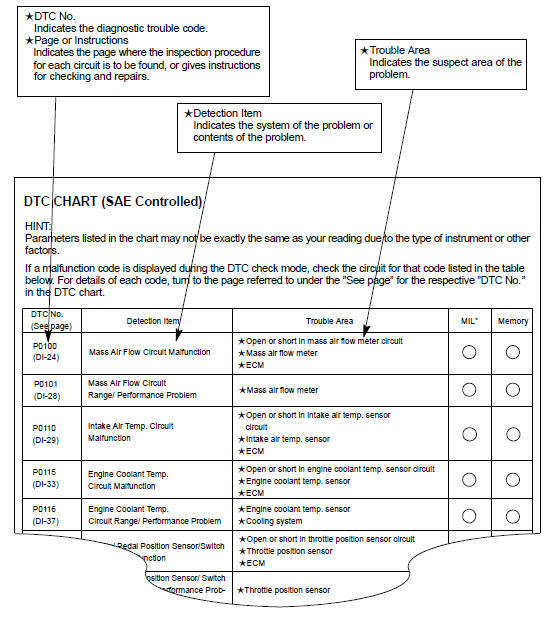 Numbers in the table indicate the inspection order in which the circuits or parts should be checked. HINT: When the problem is not detected by the diagnostic system even though the problem symptom is present, it is considered that the problem is occurring outside the detection range of the diagnostic system, or that the problem is occurring in a system other than the diagnostic system. How to read and use each page is shown below.